Collecting antique clubs can be a fun and educational hobby. Some historians say the game of golf has been around for more than 500 years. Clubs and other equipment can be dated back to different eras throughout that time. To find clubs with significant value, you need to look back, definitely before World War II and probably before 1930, the year steel shafts and matched sets became common in golf club manufacturing. Before that time, shafts were made of hickory, all iron heads were forged steel and woods were hand-carved from a single piece of persimmon. Clubs from before the turn of the 20th century can be worth quite a bit, presuming they were made by a prominent club maker and are in good condition. A driver from the 1860s hand-carved by Old Tom Morris or Laurie Auchterlonie in St. Andrews, for instance, could be worth a few hundred dollars or up to $20,000 depending on the model, condition and authenticity. Where to find these vintage clubs is an intriguing question. There's always a chance you might find something worthwhile at a garage sale or in a bargain bin at your local driving range shop, but to find truly valuable clubs, sporting goods memorabilia shops and even antique shops are where you should start your search. Of course, you should gauge your budget based on what purpose your collection is designed to serve. Are you trying to put together a valuable antique collection or simply decorate your home with vintage items? Some classic, wooden-shafted clubs that are not worth much on the antiquities market will still look marvelous on your wall. Unusual or particularly rare clubs can be worth quite a bit in the vintage club market. Custom clubs were made quite often in the days before 1900. Based on the unique qualities of their design or the fact that there may be only one or a few in existence can certainly raise the price. One such iron, a rake iron designed to hit balls out of mud and water, was estimated to go for less than $300 at auction. It sold in 1989 for almost $80,000. Prices like these, while unusual, do happen now and again. Values in the vintage club market fluctuate wildly based on many factors. Clubs with a particular tournament or player history are one area of the market where you could find value in a contemporary club--but not necessarily. A famous story first rose to the surface in the mid 1980s. A man in Texas purchased an old Hogan 1-iron out of a bargain bin. When he noticed the dime-sized wear mark on the sweet spot, he started to wonder if this could be the famous 1-iron used by Ben Hogan himself to force a playoff in the 1950 U.S. Open at Merion. Eventually, the man contacted the USGA and Hogan himself to authenticate the club that had disappeared from Hogan's bag sometime between the famous shot and the playoff the next day. The club was missing for some 30-plus years. Clubs like this one, if authenticated, would certainly generate a significant sum at auction. This particular club, however, was loaned for display to the USGA's Golf House Museum. Clubs owned by champions and presidents and celebrities can fetch tidy sums based solely on their previous and famous owners. 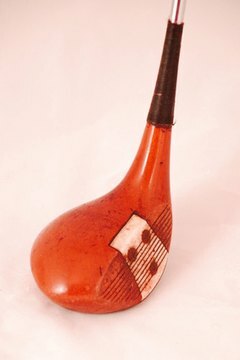 As with other antiques, authentication always poses a challenge with vintage golf equipment. While identifying certain clubs as an iron made by Tom Stewart of St. Andrews, for example, is often not difficult, precisely dating them is much more difficult. Patent numbers were not printed on most clubs until the 20th century, if even then. Beyond that, slight variations in design and imprint from year to year make it nearly impossible to identify clubs by year. To authenticate a club as one a particular player used for a particular shot is even more difficult as memories fade and time passes. The Hogan club, for instance, was identified by Hogan himself only to the best of his recollection.